If you're looking for a compilation of some easy ukulele songs, you may want to check out these 10 ukulele songbooks. Ukulele songbooks are short (or long) ukulele instruction manual guides for beginners. They usually contain several songs, sheet (or tab) music for them, and a play-through. Learning from a music songbook is one of the best ways to get the basics down, and they’re pretty cheap overall. We’ve reviewed the top 10 ukulele songbooks for beginners, so let’s see what we found and what they can offer you! Rebecca Bogart brings us this magnificent book and online video. The author, Rebecca Bogart, worked hard with her co-author Jenny Peters, her editor Loretta Crum, and Joe Barstad, the illustrator, to bring this fantastic ukulele songbook together. Here, you can learn 21 songs by listening and watching. The method of this book starts easy and progressively gets harder, but not to the point where you get to a professional level – this book was intended to give you the means to get the basics down. The “21 songs in 6 days” is even used as a classroom book. The songs in this songbook include the strum patterns, the chord diagrams, the sheet music (and how to read it), and lyrics. Easy Songs for Ukulele is one of the best ukulele songbooks that features simple ukulele songs. You can easily learn the songs from Joh﻿﻿﻿nny Cash, Beatles, Woody Guthrie, Elvis, Simon & Garfunkel, etc. 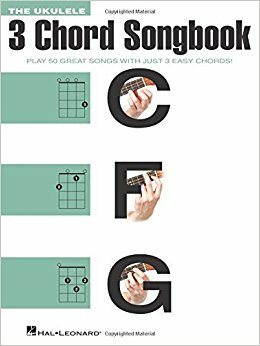 The songbook starts off easy on the reader – you get the simplest songs at the beginning, only to progress to a harder level with time.This songbook demonstrates the most basic chord diagrams, but it also includes the lyrics for the songs in it. Among the 20 songs in this great book are included “Ob-La-Di, Ob-La-Da”, “We Shall Overcome”, “I Walk the Line”, and more. This book is the masterpiece by Ben Parker – the author of “How to play Ukulele” & “My First Ukulele”. These two books were best-sellers as soon as they came out, and 'Easy Ukulele Tunes: 30 Fun and Easy Ukulele Tunes for Beginners' joined them in their full glory. This songbook features easy ukulele tabs, simple ukulele songs, and some of the best ukulele beginner songs. You can also find sheet music for these 30 songs here. The best things about this songbook are that it’s comprehensive, it’s easy to read and understand, and it’s not expensive at all. 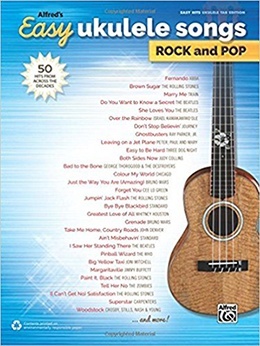 Alfred’s easy ukulele songbook features 50 hits from prominent rock and pop musicians, such as Judy Collins, Ray Parker Junior, Chicago, Bruno ﻿﻿﻿﻿Mars, The Rolling Stones, Whitney Houston, The Beatles, The Who, The Zombies, and more. 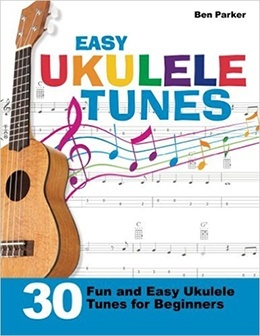 You can easily learn to play these songs on your ukulele, as this songbook features a detailed description and sheet music (tablatures) for each song, as well as step-by-step instructions. 'Alfred’s Easy Ukulele Songs' songbook is very affordable, and it might be your best bet on grasping the fundamentals of ukulele playing techniques. 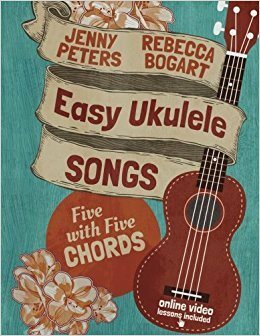 We’ve already mentioned a magnificent ukulele songbook by Rebecca Bogart (21 songs in 6 days), and 'Easy Ukulele Songs: 5 with 5 chords' is her other masterpiece. This songbook is another collaboration of Rebecca Bogart and Jenny Peters. It features detailed descriptions of the 5 basic ukulele chords, their composition, and how to play them. You can use these chords to practice your ukulele skills, recognize them in other songs, or even make your own songs. This songbook is incredibly cheap, and it also features a video instruction DVD that will make the process of learning the ukulele basics even easier. The illustrated “Ukulele 3 Chord Songbook: Play 50 great songs with 3 easy chords” songbook was written by Hal Leonard, and it features the songs Bad Moon Rising, A Boy Named Sue, Free Fallin’, Hound Dog, Shelter from the Storm, Time for me to Fly, Twist and Shout, and many more great hits. The author of this songbook advocates that knowing the three basic ukulele chords (C, F, and G) can step up your ukulele playing skills to a new level. The explanation of each chord will give you the means to recognize chords in the songs provided, and you will quickly translate the theory into practice if you follow the guidelines. This songbook comes at a very affordable price, and it’s very valuable for the cash. 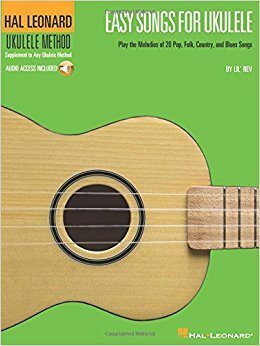 The "First 50 Songs You Should Play on Ukulele" (Hal Leonard) is another popular book and it’s available as a paperback or for Kindle. This book is for the player who has learned the basics and is ready for a song book. It includes classic oldies like Edelweiss, The 59th Street Bridge Song (Feelin' Groovy), I'd like to Teach the World to Sing, Peaceful Easy Feeling, Puff the Magic Dragon, Take Me Home, Country Roads, This Land Is Your Land, You Are My Sunshine and more. It includes newer songs as well. 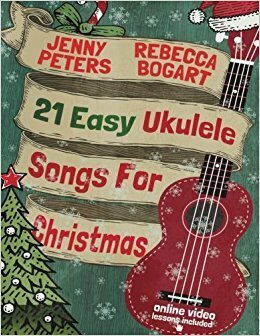 The '21 Easy Ukulele Songs for Christmas' is another great ukulele songbook by Rebecca Bogart and Jenny Peters. Their collaboration with “5 with 5 chords” was exceptional, so it’s only obvious that this songbook earned much respect and love in no time. The method of “easy to hard” songs was carefully implemented, as is common with Rebecca’s books. This means you can start off learning easy songs and progress to harder songs when you feel you’re ready. This songbook is also quite cheap, and is perfect for preparing yourself for the festivities in the best way possible. 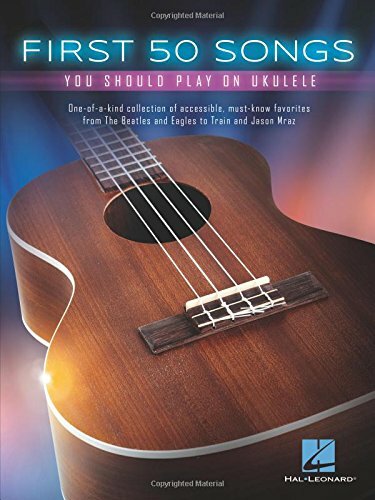 Hal Leonard’s 'Easy Songs for Ukulele' is a songbook which includes beginner ukulele songs, tablatures, and playing techniques, styles, and methods. 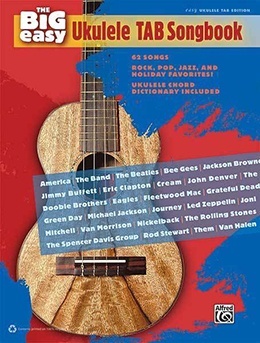 Included in the book are some of the most famous songs from The Beatles, Elvis, Woody Guthrie, and more, as well as detailed description of how to play them. This songbook features the playback setting which lets you change the tempo of the songs played without having to adjust the pitch or loop passages. “Easy songs for Ukulele Method” by Hal Leonard is very valuable, and quite affordable. 'The Ukulele TAB Songbook' is another great ukulele songbook by Hal Leonard. It features 62 ukulele songs for beginners, arranged in a straightforward fashion. It includes song picks from classical music, rock music, pop and jazz, and even Christmas music. The songs are performed by Led Zeppelin, Green Day, Jimmy Buffett, Nickelback, Spencer Davis Group, Van Halen, The Rolling Stones, and more. This uke songbook costs a bit more when compared to the other books we’ve mentioned, but it also contains the most detailed playing instructions. Great value for the cash. It’s hard to say which songbook is best – people have different learning and teaching methods. What’s good for some, may be difficult to others. 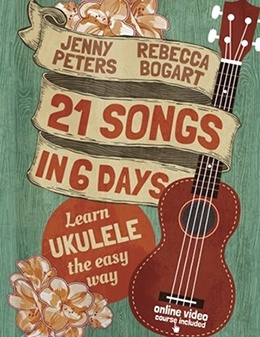 Either way, you can’t go wrong with Rebecca Bogart or Hal Leonard – they make the best “easy songs on ukulele” CDs and DVDs.